Given the fact it's got giant robots and weird-lookin' giant aliens, Pacific Rim isn't the easiest movie to cosplay as. 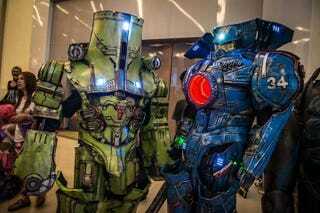 Which only makes this badass Pacific Rim cosplay even more impressive. Thai cosplay outfit C4 Team have made not only three Jaegers (complete with lighting), but a Kaiju as well. If you're wondering why there's also a girl dressed as Mako, well, check out the choreography on this stage performance. You can see more of C4's work (including some amazing Gundam and Transformers outfits) at their Facebook page.